Sounds and looks wonderful! I pinned for Meatless Monday inspiration. Thanks for sharing! Oh yes! definitely goat prosciutto topping on this Dedy. I must come by and see what fancy food you have been preparing these days. Thanks for stopping in! Love goat cheese and beets, Beautiful food. Great ingredients, so colorful with the beets too. It looks like you use the raw beets in the dish itself and perhaps let it bake in the oven with all the rest? Yumm to the goat cheese too. Your comment made me smile! :) I think you have a perfect scenario here with the glorious sunshine and chilled Sauvignon Blanc, which happens to be my favorite wine at the moment… So nice of you to stop in and leave me a comment Colette. So simple and beautiful. You cook very much like I eat. It’s what I love about your recipes. The pie is particularly gorgeous with all of those colors. Enjoy the remodeling! The best part of remodeling is when a project is done! I wish the process was more enjoyable. It seems like around every corner is a can of worms! We just opened up the visqueen wall surrounding the kitchen so we’re back in business! :) Thank you Amanda and hope you have a wonderful weekend in Mexico! Oh my! I will trade you as many strawberry shortcake cookies you desire for a slice of this magnificent pie!!!!!!!!!!!!!! Nothing like putting all the ingredients of a favorite salad in a pie crust to put it over the top! Making this for sure! You’re on…I’ll trade anything for your strawberry shortcake cookies! :) You are right about favorite salad ingredients…doesn’t get much better than a beet, goat cheese and walnuts. Then to toss them on top of a crust and bake it is fantastic! Oooh yes! All the things I love. :) Nice to see your comment today…thanks for stopping in! Hoping your pie crust came out well. And loving your photos, BTW. The beets are such a good colour against those woods. Even though beets are never going to be a favourite I loved this combination (without the walnuts) last month. I ended up having soft goats’ cheese on bread with beets as part of a larger salad. So good. Soft goats’ cheese on bread with beets sounds lovely! Funny you should mention the crust. I didn’t have it in me to write about it in the post but the crust I made for this particular pie completely failed. It failed so bad I tossed it in the compost and used a back up store bought I had in the freezer! Oh well, since then I have had one success with a strawberry pie. Good thing I had the back up store bought crust because I had all the ingredients ready to go. Thank you regarding the photo’s! Huge compliment coming from you! I LOVE beets and goat cheese and never thought of putting together in a tart. It looks so beautiful I have to try it. What a wonderful combination. When I saw the recipe it was a ‘hand slap forehead’ moment! Of course beets, goat cheese and walnuts in a pie! It was fantastic and hope you try it Suzanne. A lovely combo of beets, goats cheese and walnuts – this could win over even the biggest of meat eaters…..and as for the kitchen table just think how much you’ll appreciate it when it does arrive…. I hope it’s a nice big dinner table! I love goat cheese and the other ingredients in this tart–it sounds so good! Yes! Goat cheese is a favorite of mine and especially paired with beets. I could eat pie everyday, rather it’s savory or sweet, it doesn’t matter. :) Thank you Nancy! This is my kind of recipe. I will bookmark it for when my beets (of which I have many) ripen in my garden. I love this tart too Linda! It certainly has all the wonderful elements of a savory tart, especially with the walnut bits and goats’ cheese. Enjoy your weekend! Looks damn fine my friend. That mint at the end sealed the deal fo’ sho. We have a ton of mint growing wild out back and I’m always looking for ways to use it other than mowing over it with the lawn mower to get an aromatherapy treatment. :) Julep? Your photos always look absolutely stunning Seana – I wouldn’t consider changing a thing! 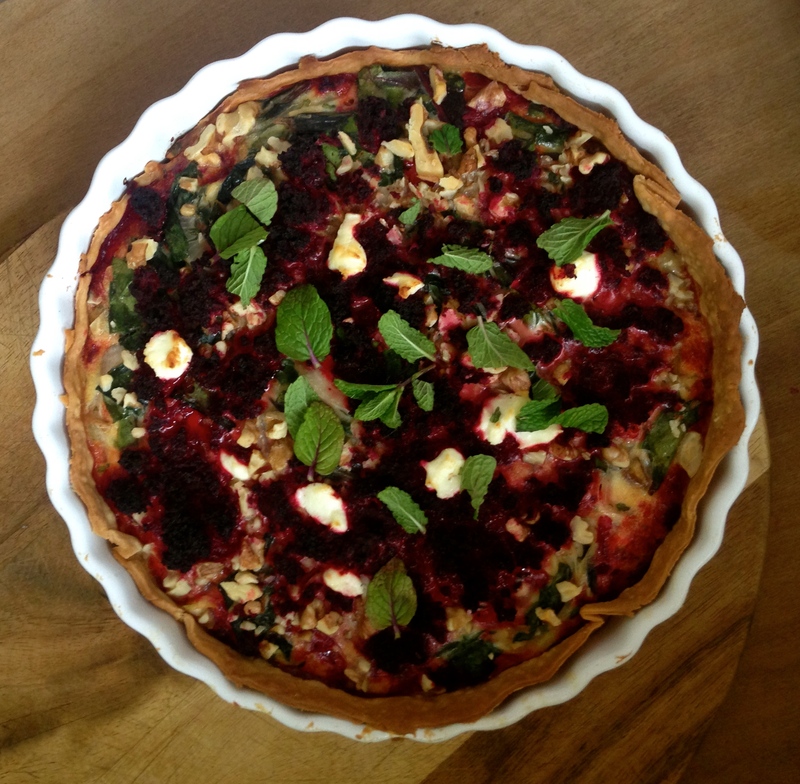 Beautiful savoury tart to share with us today… sounds really delicious! Still on the road Seana! Will surely try once I am settled!! Love meals like this, just picked up beets with there tops today at the farmers market, have all the ingredients to make this, how often does that happen? Anyway, we remodeled a few years back and it took a whole year. I started getting pretty creative, when I look back it wasn’t that bad. Have a great week-end! Yes! remodeling can be really fun when you are in the creative process of it! It’s the grueling “grunt work” that really takes it out of you…like scraping old glue off of floors (for weeks!) in order to sand them! But it sure is satisfying when it’s done and you are sitting in that room, with a glass of wine, admiring your new floor! :) Always so nice to read your comments Cheri! Gosh Seana– I can’t believe you could summon up this beautiful tart in the middle of a kitchen remodel!! It really does look intriguing– savory and pretty as a dessert! Hope everything comes out well with your kitchen. Progress! Hope it all goes well. You are intrepid. Ooh, I’m obsessed with beets and this looks amazing! My love for them is quite recent, so I’m always looking for new recipes to try. This is going on my “must make” list. Yum! Another triumph in the tiny white cottage. Love it. This is going in my must-make-soon file! I have one of those files too! :) Hope it makes it to the top of the list, it’s a lovely pie and the color is very impressive. Pure fabulousness! My kind of pie – a savory one! You don’t need fancy food styling to make this look any more appealing than it already is!!! 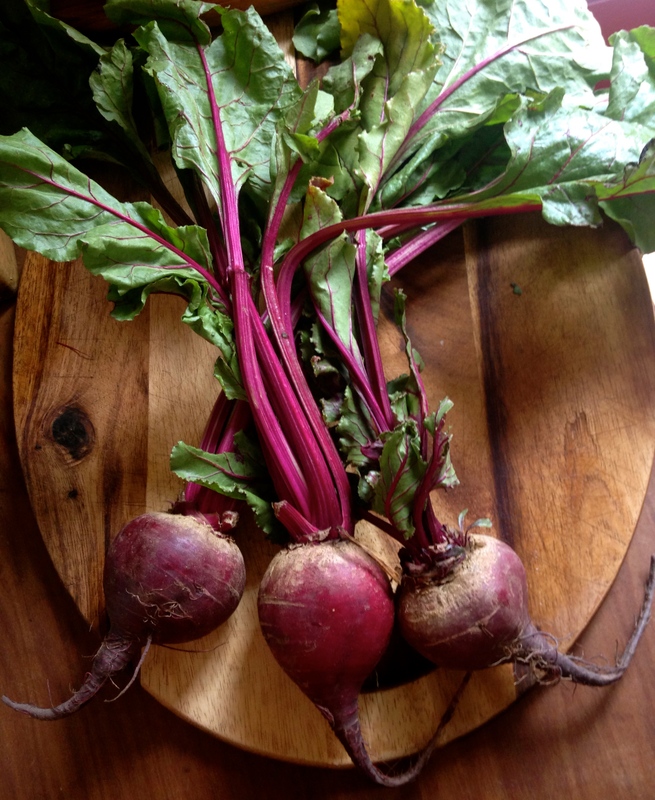 I’ve started eating beets 2-3 years ago… that’s way I am a kind of newbie experimenting with this vegetable! I’m sure that I would love your pie… Thanks a lot for sharing! Aren’t beets wonderful?! We love to bake a couple and have them in the refrigerator to add to salad during the week. They are delicious with just a little olive oil and salt. Thank you! My husband is not a fan of goat’s cheese and I am not a fan of beets, but it is truly a beautiful pie! I feel your pain with the remodel! At least our kitchen and bedrooms are done now. Next – the bathrooms! This is just simply such a thing of beauty. Something so special about a savoury tart – that simple layer of pastry elevates everything. Lovely job Seana. First your photos are mouthwatering! Second, may with this pie will finally be able make eat some vegetables to my fiancè! This pie looks sooo gooooood and healthy (not diet healthy, but delicious healthy!). All the best with your cottage remodel. You’ve done amazingly well without a kitchen table! Love beet, goat cheese and walnut salad – such a great idea to use this combination in a pie! So colorful. I need a slice of that to brighten up my dreary, freezing Melbourne morning. Thank you so much Fae! :) I always love your comments and appreciate that you stop in! Wow – this look amazing. All my favourite flavours. You are currently reading beet, goat’s cheese & walnut pie at COTTAGE GROVE HOUSE.